Perhaps it was because of the weather. The muskeg was bathed in the warm sunlight. It was the first full sun this area had seen in over a week. I noticed a black and yellow dragonfly and saw it land not too far from me, so I followed it to see if I could get a picture. I tried to approach slowly, but as I got closer it would fly off, but each time I was able to see where it landed so I tried again. Eventually, I was able to get some pictures, as the dragonfly either got used to me or became tired. While I was chasing the first one, I noticed another one. This one was a brown and black damselfly. With a little persistence, I was able to get photos of it also. 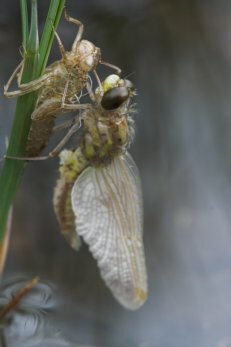 As I continued on, I noticed a few other dragonflies flying around, but when I stopped near a muskeg puddle, I happened to see a dragonfly that had recently emerged. As I looked more closely, I noticed at least 10-15 exuvia (the larval husks) both with teneral s (dragonflies that have emerged from husk, but can’t fly) and without. The tenerals were in various stages, from very recently broken out to looking flight ready. 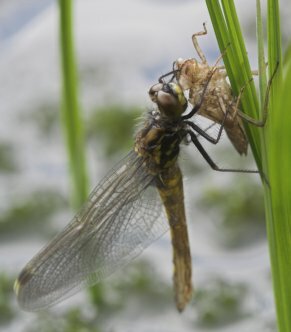 I also saw at least one where the dragonfly had just crawled up the sedge but not yet broken out of its last larval shell. It appeared that all the emerging dragonflies in this puddle were the same species. I think they were Hudsonian Whitefaces, but I am not sure. Ordinarily they would be black and red, but I read that when they are still immature adults they can be yellow and red. I was a little surprised at how different they look after just emerging. Compare the two below. This dragonfly had been out of the larval husk for a while, but had a long way to go. I saw some that looked even more flimsy and less dragonfly-like than this one. This dragonfly was getting close to looking like an adult, I do not know how long it would take for it to be ready to fly. As I continued walking around the muskeg I made an effort to look in the ponds. I did not find any ponds with quite the number of exuvia/tenerals as the first one, but I did see three damselfly (two exuvia, one teneral) on a pondlily leaf in one pond, and a few other exuvia that probably were the same species as those I noticed in the first pond. I also flushed up a robin from near one puddle. It had a beak full of what appeared to be at least a couple of tenerals. 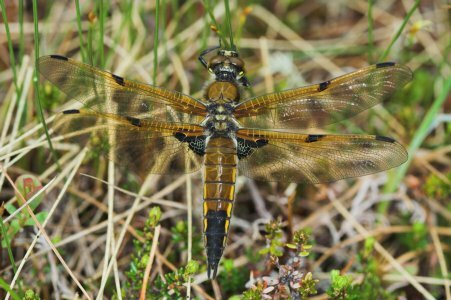 All told, I saw at least three species of odonate, the ones I am tentatively calling Hudsonian Whiteface (lots of them), a few damselflies (as yet unidentified species), and a Four-spotted Skimmer. This entry was posted in activities, birds, insects, photo. Bookmark the permalink.